Firstly let look on circuit wiring. 1-> Send signal to trigger measurement action for DHT11. 2-> After get communication with DHT11, sensor will send back 5 byte data measured. 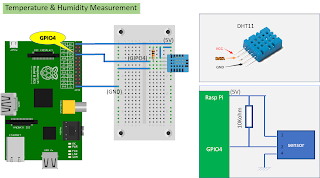 - Rasp Pi set DATA as ouput, then pull DATA to low state (0) during 18ms à DHT11 understand that, RaspPi want to measure temperature and humidity. - Rasp Pi get DATA to high state(1) then set DATA pin as input. - After 20-40uSec DHT will pull RaspPi Data pin to low state. If >40uSec Data pin stall in the high state mean that still cannot contacted with DHT yet. - Data pin will keep low state during 80us then DHT will pull to high state after 80uSec. By monitor Data pin, RaspPi can know that communication is ok or not. If signal raising up after 80uSec mean that DHT complete send data to Raspberry. Step 2: Read data in DHT11. + Byte 1 integer value of humidity. + Byte 2 decimal value of the humidity. + Byte 3 integer value of the temperature. + Byte 4 decimal value of the temperature. + Byte 5 check the total value. - If Byte 5=Byte1+Byte2+Byte3+Byte4, then measurement process is correct, otherwise it was wrong. pi.write(power, 1) # Switch sensor on. self.bad_CS = 0 # Bad checksum count. self.bad_SM = 0 # Short message count. self.bad_MM = 0 # Missing message count. self.bad_SR = 0 # Sensor reset count. # Power cycle if timeout > MAX_TIMEOUTS. pi.set_watchdog(gpio, 0) # Kill any watchdogs. humidity low, temperature high, temperature low, checksum. # Edge length determines if bit is 1 or 0.
if diff >= 200: # Bad bit? self.CS = 256 # Force bad checksum. if self.bit >= 40: # Message complete. elif self.bit >= 32: # In checksum byte. if (total & 255) == self.CS: # Is checksum ok? if self.tH & 128: # Negative temperature. if self.bit < 8: # Too few data bits received. self.bad_MM += 1 # Bump missing message count. self.bad_SR += 1 # Bump sensor reset count. elif self.bit < 39: # Short message receieved. self.bad_SM += 1 # Bump short message count. else: # Full message received. """Return time since measurement made.""" """Return count of messages received with bad checksums.""" """Return count of short messages.""" """Return count of missing messages.""" """Return count of power cycles because of sensor hangs.""" """Trigger a new relative humidity and temperature reading.""" # Intervals of about 2 seconds or less will eventually hang the DHT22. time.sleep(next_reading-time.time()) # Overall INTERVAL second polling.